A monopoly is a market with a single seller (called the monopolist) but many buyers. In a perfectly competitive market, with a large number of sellers and buyers, no single buyer or seller can influence the price of a commodity. Unlike sellers in a perfectly competitive market, a monopolist exercises substantial control over the market priceConsumer Surplus FormulaConsumer surplus is an economic calculation to measure the benefit (i.e. surplus) of what consumers are willing to pay for a good or service versus its market price. 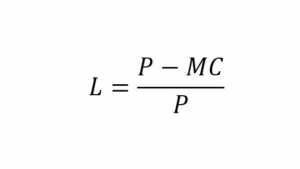 The consumer surplus formula is based on an economic theory of marginal utility. The theory explains that spending behavior varies with the preferences of a commodity. The quantity sold by the monopolist is usually less than the quantity sold by a perfectly competitive firm and the price charged by the monopolist is usually more than the price charged by a perfectly competitive firm. While a perfectly competitive firm is a “price taker,” a monopolist is a “price maker.” Similar to a monopoly is a monopsony, which is a market with many sellers but only one buyer. As the monopolist is the sole seller of a product in the market, it does not need to worry about any competitors. The monopolist can raise the price of a product without worrying about the actions of other competitors. In a perfectly competitive market, if a firm unilaterally raises the price of a commodity, it will simply lose market share as buyers can simply move to other sellers. Key to understanding the concept of monopoly is understanding this simple statement: The monopolist is the market and controls the amount of the commodity available in the market. However, a monopolist, a profit-maximizing monopolist at least, can’t just charge any price it wants. Consider the following example: Company ABC holds a monopoly over the market for wooden tables and can charge any price it wants. However, Company ABC realizes that if it charged $10,000 per wooden table, no one would buy it and the company would have to shut down. This is because consumers would substitute other commodities such as iron tables or plastic tables for wooden tables. Thus, Company ABC will charge that price that will allow it to make the maximum profit possible. In order to do so, the monopolist must first determine the costs and characteristics of market demand. Consider the following example. Company ABC is the sole seller of wooden tables in a small town. The table above shows the demand curve faced by Company ABC as well as the revenue it can earn by selling wooden tables. The first two columns show the demand curve faced by the monopolist. If the monopolist supplies only one wooden table to the market, it can sell that table for $10. If the monopolist produces and supplies two wooden tables to the market and wants to sell both, it must lower the price to $9. Similarly, if the monopolist produces and supplies three wooden tables, it must lower the price to $8 to sell all of them. The third column shows the total revenue the monopolist can earn by selling varying quantities of wooden tables. The fifth column shows the monopolist’s marginal revenue. This is the additional revenue earned by the monopolist when it increases the quantity sold in the market by one unit. For a monopolist, the marginal revenue is always less than or equal to the price of the commodity. This arises because the monopolist is the only seller in the market and thus faces a market demand curve that is downward sloping. For example, if Company ABC raises production and supply from 3 wooden tables to 4 wooden tables, its total revenue will increase by only $4, even though it charges $7 per wooden table. The costs faced by the monopolist would depend on the nature of the production process. Consider the example of a monopolist who wants to expand production. The commodity produced by the monopolist requires a large quantity of skilled labor for its production, and skilled labor is in short supply. Thus, as the monopolist raises output, it must pay more for skilled labor (as skilled labor gets scarcer, it charges a higher price). 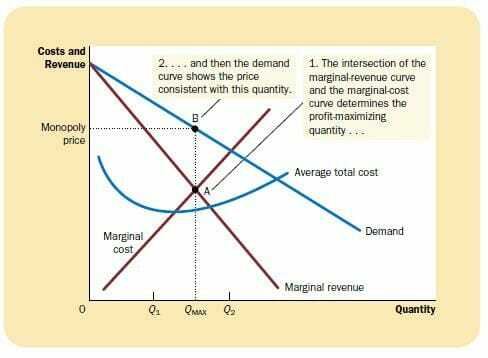 This results in the monopolist facing an upward rising marginal cost curve as shown below. The monopolist produces that quantity of the commodity that equates marginal revenue with marginal cost. The marginal costMarginal Cost FormulaThe marginal cost formula represents the incremental costs incurred when producing additional units of a good or service. The marginal cost formula = (change in costs) / (change in quantity). The variable costs included in the calculation are labor and materials, plus increases in fixed costs, administration, overhead is the change in the total cost of production when production is increased by one unit. The price charged by the monopolist depends on the market demand curve. A common measure of monopoly power in a market is the Lerner’s Index.